One of the main perks of travelling by campervan is the availability of kitchen facilities, instead of being huddled over a camping stove and slowly running out of matches and the will to carry on! But even with these facilities, cooking in your campervan can be quite the adjustment compared to your spacious kitchen. That’s why we have come up with some easy but delicious camping food ideas to save you any trouble or hassle. These dishes work on a stove, grill, campfire or whatever cooking appliance you plan to use - or do them in your kitchen for a fun and easy meal! 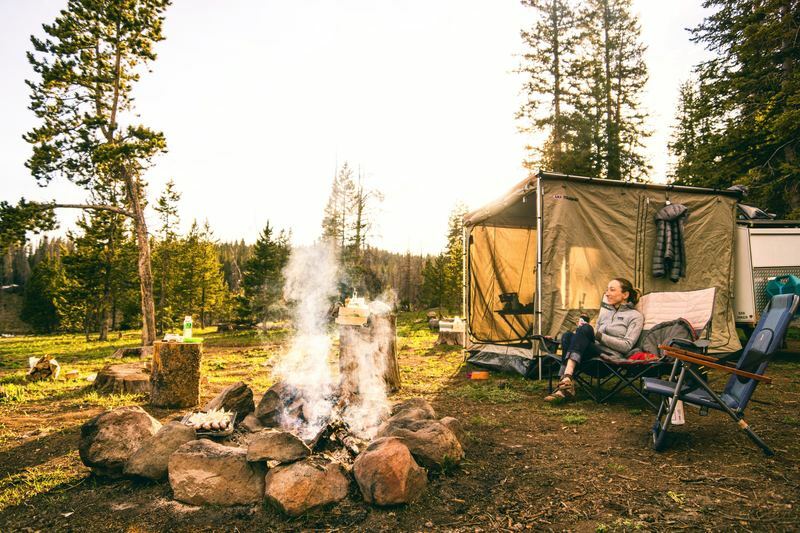 A camping trip is about relaxing, and so your food during the trip certainly should not be a source of stress! Read on for easy camping meals for each meal of the day as well as some general tips. One of the most important camping food hacks is space, as that is something that can be very limited when travelling. To avoid bringing unnecessary items, try to plan your meals in advance. Doing this can allow you to plan meals that re-use several of the same food items or spices. For example, if you’re going to bring a block of cheese, then plan to have cheese sandwiches for lunch one day, and then a cheese pasta dish for dinner. Try limit yourself to 5 spices maximum, and ensure they are ones you can reuse easily. When I go camping, I always bring salt, pepper, garlic powder (to save the trouble from using fresh garlic and needing to clean more utensils), oregano and chili flakes. I find these spices easy to combine and use in numerous dishes, and the chili ensures my meals never get dull or boring! Make sure to bring tupperware, as leftovers ensure you can cook one less meal the next day and save yourself both cooking and cleaning time - more time for a good hike then! A tip I always try to follow is to also bring a few meals prepared ahead, and I just put them in the fridge as soon as I get into the campervan. I personally like to do this with a fresh pasta salad to eat on my first day of travelling. Alternatively, it can be smart to do this with dishes that require more space or appliances to make, such as a homemade soup, a delicious hearty pie, or a homemade pasta sauce you can then use several times by simply boiling some pasta! Breakfast can be as easy or difficult as you desire. You could simply bring some milk or yoghurt to store in your fridge and eat it with some granola or oats, a good way to fill up for a full day of activities! Also consider making overnight oats, through soaking your oats in milk or water so they’re ready to be feasted upon in the morning. No fuss required, and here is a great recipe for anyone looking to try it! Try to bring a lot of fruit to keep you energized and healthy. Also be on the lookout for good deals during your travels, as often vendors by the road or farms often offer delicious fresh produce at ridiculously low prices. If you’re a fan of a cooked breakfast, then there is no reason you can’t make a good old English breakfast here on the road! To make it easier, cook your sausages or bacon (or both!) first in the pan, and then do your eggs last, as this will reduce the amount of cleaning you need to do. Also consider bringing bread rolls or croissants to save yourself any hassle in the morning and be able to take your breakfast on the go. Lunch is a tricky meal to consider when camping, as it is completely based on individual preferences. But it tends to be one of the more easy camping meals. If you like a cold, simple lunch. Bring a loaf of bread and some nice spreads, and you’re set for several days! Alternatively, you could fix up a fresh salad, making it filling by either adding legumes, a form of meat or some bread on the side. If you keep the dressing on the side, then the salad can be kept in the fridge and stay fresh for several days, as this avoids it getting mushy or needing to add more dressing later. We also love bringing some hummus or other dips, and eating it with sliced vegetables and bread or crackers. It makes a lovely social lunch whilst staying healthy. If you’re a fan of a warmer lunch, then you can make a one pan meal through grilling a cheese sandwich, or cooking bacon or eggs to go on bread. 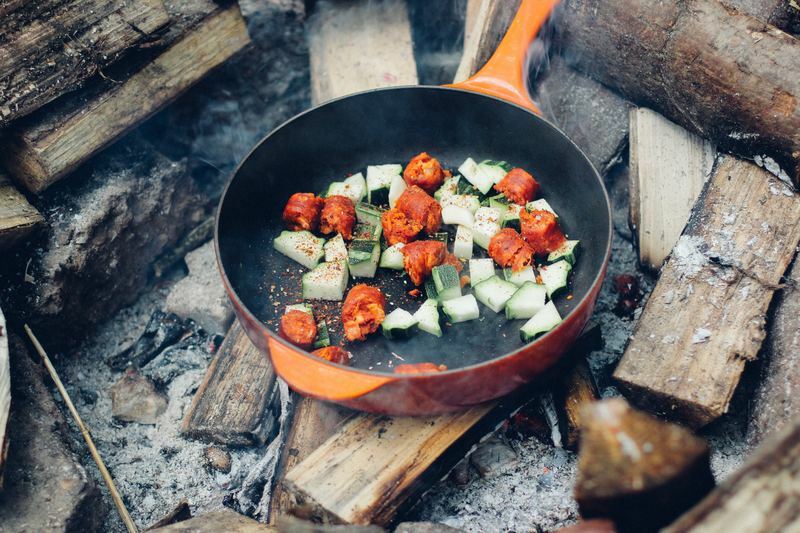 One of our greatest camping food hacks is the one pot wonder. Try to choose dishes that you can cook in one pot or pan, to reduce the amount of space needed and time for cleaning. Here is a great blog with delicious one pot camping recipes - I’m a big fan of the cheesy asparagus orzo! Generally, pasta becomes its own food group during your camping trips. It is so easy to make a variety of pasta dishes throughout your trip - an easy macaroni and cheese, a sharp pesto pasta, or a traditional tomato based pasta dish. But if you’re trying to avoid pasta, then there are numerous other camping dinner ideas for you. Consider making a filling stew or rice-based dish. When camping, I always need at least one night of vegetarian chili con carne. This dish is so easy to make, and only requires a pot for the beans and veggies, and a pot for the rice. I love topping it with some grated cheese or sour cream, and feasting on this delicious, protein-rich meal! It can also be super fun to make your meal on the campfire, bringing you and your family back to the true roots of camping. To do this, you can make a tinfoil dinner - such as a baked potato, corn on the cob or a premade burrito! You can cook hot dogs using marshmallow roasting sticks, or hamburgers using a grill. If you have a dutch oven at your disposal, you could make a dutch oven pizza or ham and cheese gratin. This blog outlines what a dutch oven is, how to use it and some delicious recipes possible with it! There are plenty of camping dinner ideas out there, so there is absolutely no reason for your meals to be boring or plain, cooking while camping should be a fun challenge and introduce you to great new recipes! 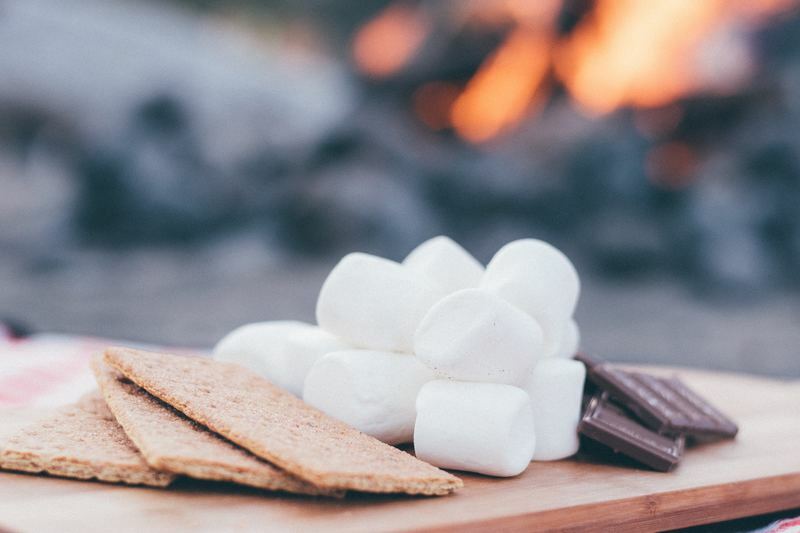 With camping food ideas, must come delicious dessert and snack ideas! For snacks, it is always handy to bring along a few granola or snack bars, as these are super easy to store and stay good. You can take them with you on a day out, to keep energized and ready for an adventure! You can also always snack on fruit, and perhaps bring fruit that is sustainable out of a fridge (e.g. apples, pears and nectarines) so that you can save the fridge space for absolutely necessary items and have transportable snacks for your days out. Now we’re all only human, and love a naughty treat, and this doesn’t have to change just because you’re camping. After all, you are on vacation! I advise baking some treats, such as cookies or brownies, before your trip and bringing them in a tupperware. This is also a great way to keep your children in check. You can also adapt your usual treats to fit your camping lifestyle. 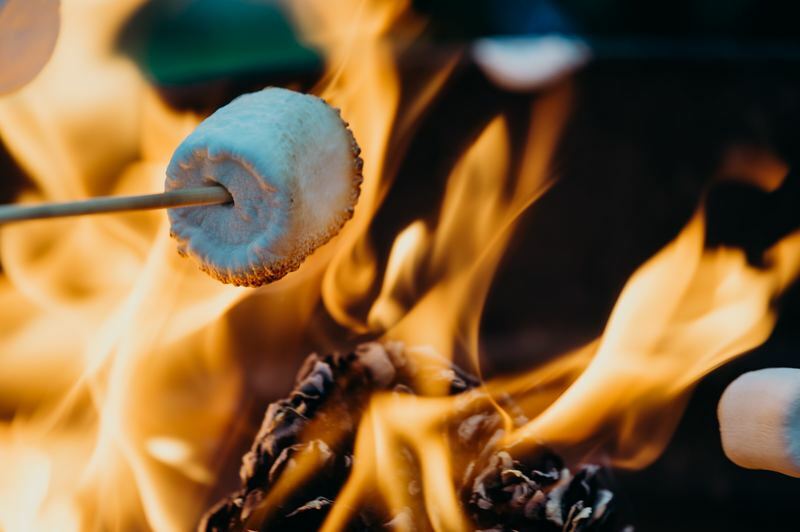 The most traditional camping treat is s'mores, and a simple way to make these is roasting marshmallows on a stick, then placing it between two graham crackers with a square of chocolate and munch away - the Americans really knew what they were doing with this one! If you fancy a challenge, try creating a banana boat. You begin by creating a slit lengthwise (with the banana still in the peel) but ensure you do not cut all the way through to the otherside. Then you stuff it with chocolate, marshmallows or any other little treats. Wrap the banana in aluminium foil and cook it over a fire for about 5 minutes. Bon appetit! There you have it, the best tips and easy camping meals we can provide. Food is a vital part of our daily lives, so make sure to make it something enjoyable, not a chore but a delight! Look around for recipes and camping food ideas tested by fellow campers, as we’re all in this together. And who knows, maybe you’ll come up with a great recipe worth sharing, in that case don’t hesitate to pass it over to us at Goboony!